An easy peppermint cupcakes recipe bursting with brisk peppermint flavor and topped with a fluffy buttercream frosting. It’s bound to be a holiday favorite. Looking for the perfect holiday cupcake recipe? Depending on which holiday is near, we have several. 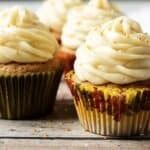 There’s the Eggnog Cupcake, Strawberry Lemonade Cupcake, Spiced Cupcakes with Maple Buttercream, Chocolate Cupcakes with Orange Buttercream Frosting, and the list goes on. Then there are these peppermint cupcakes. The recipe is simple, sweet, and loaded with fresh peppermint flavor. To save a little time during preparation we used a boxed cake mix. The buttercream frosting is made the old-fashioned way with some added peppermint extract for flavor. We encourage you to give these peppermint cupcakes a try this holiday season. First, remove your butter from the fridge to soften, line a pan with cupcake liners, and preheat your oven to 350 degrees F.
Next, place all the ingredients in a stand mixer and blend until combined. Now, fill each cupcake liner until 1/2 full. Then, bake for 18-22 minutes or until a toothpick inserted in the center comes out clean. Last, remove them from oven and transfer cupcakes to a cooling rack. Allow cupcakes to cool completely before frosting. First, place the frosting ingredients in the bowl of a stand mixer. Next, mix until combined and smooth. Add additional sugar and milk a little at a time if desired. Last, frost the cupcakes and sprinkle with crushed candy canes. Feel free to experiment with cake mixes like using chocolate or yellow varieties. The boxed instructions called for egg whites, but we used whole eggs to keep the yellow color in the batter. 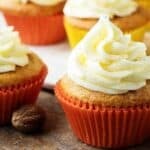 For fluffy, white frosting, beat the butter by itself before adding the extracts and sugar. Peppermint not your favorite flavor for a cupcake? Then try our Eggnog Cupcakes, Macadamia Cupcakes with White Chocolate Frosting, or our Funfetti Cupcakes with Key Lime Frosting. An easy peppermint cupcakes recipe bursting with brisk peppermint flavor and topped with a fluffy buttercream frosting. It's bound to be a holiday favorite. First, place the ingredients in the bowl of a stand mixer. 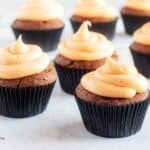 The calories listed are based on the ingredients and a serving size of one cupcake. Actual calories may vary. The peppermint cupcakes can be stored in a sealed container in your fridge for up to four days. Mmmm these look so delish!